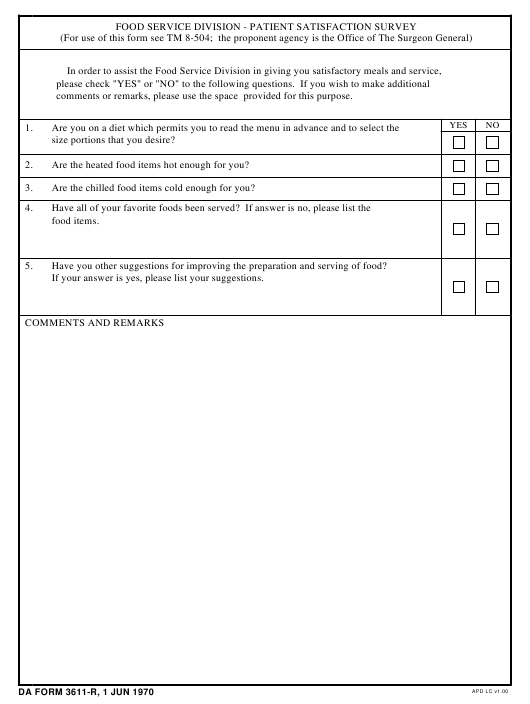 DA Form 3611-r - also known as the "Food Service Division-patient Satisfaction Survey (lra)" - is a Military form issued and used by the United States Department of the Army. The form - often mistakenly referred to as the DD form 3611-r - was last revised on June 1, 1970. Download an up-to-date fillable PDF version of the DA 3611-r below or request a copy through the chain of command. comments or remarks, please use the space provided for this purpose. size portions that you desire? Are the heated food items hot enough for you? Are the chilled food items cold enough for you? Have you other suggestions for improving the preparation and serving of food? If your answer is yes, please list your suggestions.